Hydrosense is a pioneer in the Legionella testing industry. By applying environmental technology to an industrial setting, our scientists have developed a new on-site testing method for deadly Legionella pneumophila SG 1 bacteria in water and biofilm. 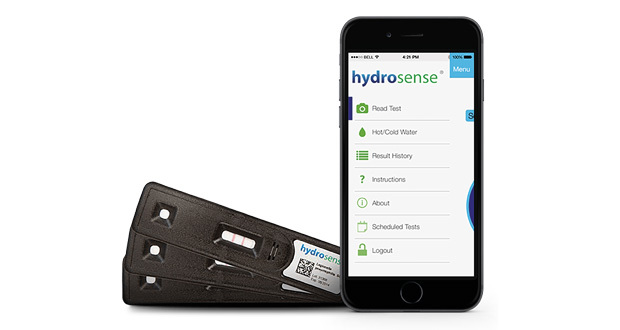 The Hydrosense test is immediate, simple and accurate; providing insights into the state of your water system in only 25 minutes. There is no need for the transportation of samples and therefore, no risk of samples being damaged en route. Incidences of Legionnaires’ disease are on the rise and conventional lab-based methods for Legionella testing remain dangerously time consuming and are often inaccurate. This combination puts lives at risk. By minimising the time taken to identify Legionella bacteria, Hydrosense reduces public health risk and helps to save lives. In parallel with periodic lab culture testing, or as a stand-alone method, this simple test helps your organisation to maintain vigilant control over water system quality. Securely stores tests results for audit with our innovative smartphone reader and portal. Other methods of detection, such as lab culture, can have dangerously low recovery rates. Even the latest ISO standard document states recovery rates of only “>64%” for lab culture testing. That’s up to 34% inaccuracy! Hydrosense will detect Viable but Non-Culturable Forms of the bacteria which can infect human lung cells yet will never be detected by Lab Culture methods. Warren Buffett once said, ‘It takes 20 years to build a reputation and five minutes to ruin it.’ Real time water testing helps to keep organisations safe from outbreaks and the related reputational damage and revenue impacts. Our simple test enables earlier calls to action, while still on-site, and provides assurance that a high standard of service has been achieved, thus improving long-term customer value for FM companies.